Chancellor Park was built and opened in 1998 on open land separating the older Chelmer Village development from the A12 and was intended to accommodate the growing population of Chelmsford. There are approximately 1000 addresses on the development ranging from flats to five bedroom houses of mixed tenure, private ownership and housing association. More than one developer was involved in the construction. Persimmon Homes constructed a large percentage of the houses on Chancellor Park. Croudace and Knight Developments built later additions to the development. Taydal was approached by our long-term client, Cre8tive Construction Ltd, regarding a project at Chancellor Park, Chelmsford. 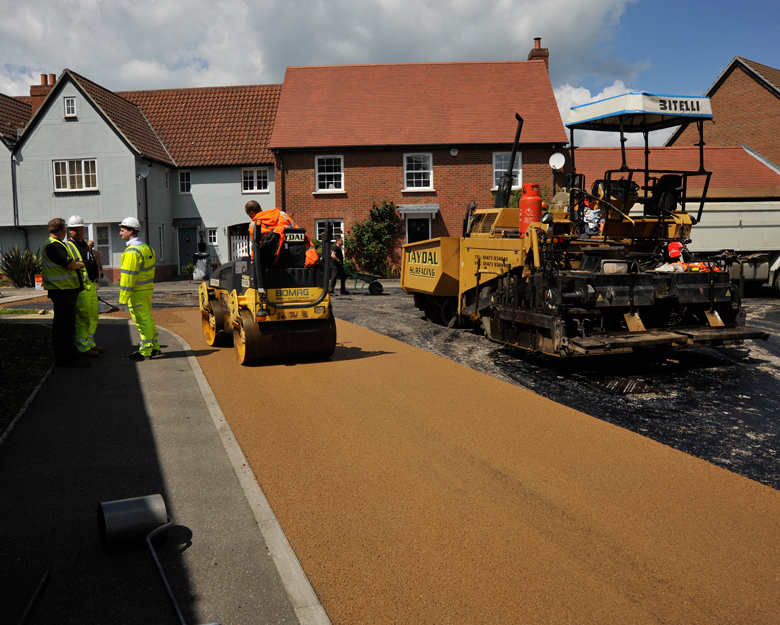 The carriageway project included a requirement for a 40mm thick, buff coloured, asphalt wearing course with a 50 polished stone value (PSV). There was an additional requirement to plane off the existing base course to ensure 40mm thick wearing course could be installed and meet the designed levels of the project. Our estimator, Shane Dale, dealt with the quotation and sourced materials that met the required 50 PSV buff specification. He also liaised with local council representatives to ensure that our planned materials were compliant with the low PSV value required for the skid resistance of the carriageway, which would usually be 55 PSV. Our Director, Wayne Dale, then oversaw the on site delivery of materials by meticulously planning the daily workload to meet the coordination needs of the project. Our contracts manager, Stuart Sangster, undertook a pre-start commencement survey to measure the exact meterage of the works in order to check existing levels prior to the beginning of our work, and to make sure that we did not over order materials. We planed down the base course, applied a bond coat to the whole area to aid adhesion of the wearing course to the base course, and then surfaced 1100m2 of the new Taylor Wimpey housing estate carriageway with a 40mm thickness of Lafarge Tarmac UltiColour wearing course. The £50k project was undertaken in a three day period, with letters sent to existing residents to advise and apologise for any inconvenience caused during our installation.